The Spacematic Series from Fortis ranks among our favorites - there's nothing like a bit of 60's and 70's "cool". This watch is both retro and modern at the same time, and because of the large numerals and indices is extremely legible. The Fortis Cosmonauts Spacematic watches with black dials are already among our best selling watches, and the new all luminous white dial creates a fresh look for a very familiar watch. 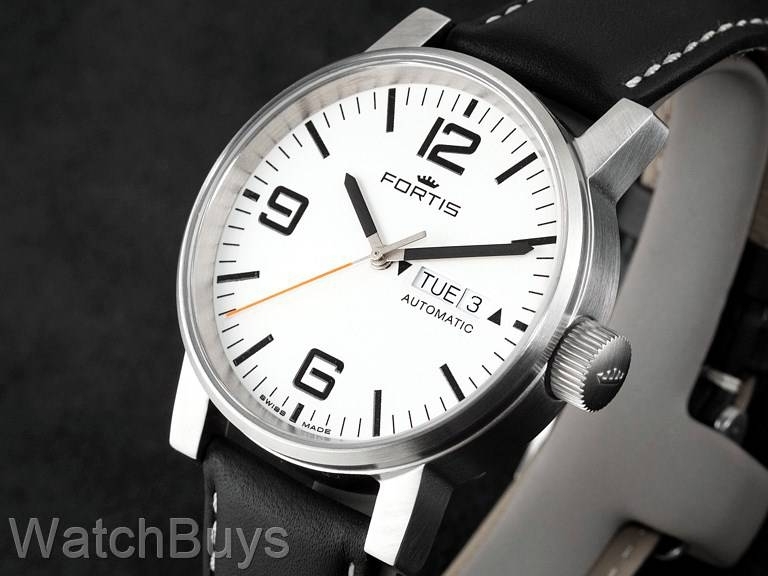 Fortis didn't officially name their Spacematic line until the 1970's, but its roots go back a decade further to the US Gemini Astronauts, who wore some of the first Spacematic watches on their missions. The Spacematic collection relies on four core tenets: high functionality, excellent readability, robustness, and ease of use. The Spacematic is housed in a satinized stainless steel, 40 millimeter case, with black accents on the dial. Numerals can be found at 12, 6, and 9. The numeral at 3 has been omitted to make room for the dual language day/date display. Select either German or English days through the quickset crown and the watch will maintain that language. Black minute and hour hands are distinctly defined against the luminous white dial. 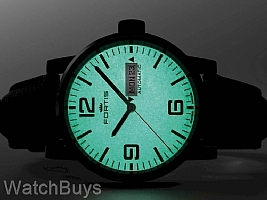 The entire dial is coated with SuperLuminova with a green night glow. An orange seconds hand is impossible to miss as it provides high contrast to the dial. This watch is fitted with a tan Fortis calf leather strap with tang buckle. "The watch I've been waiting for!" Verified Owner Comments: I've been looking for a mid sized legible watch for a long time. 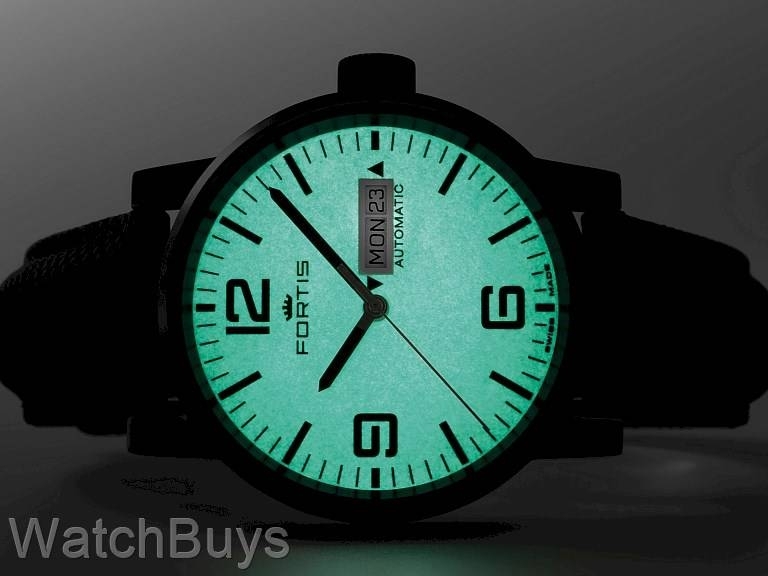 The fact that the dial on this watch is luminous is icing on the cake. I don't imagine there will ever be a time when I cannot pick up the time with just a quick glance. The watch keeps great time and I love the spartan dial. I know this company cares as the watch arrived set with the correct date and time set (the watch was within 2 seconds of the actual time after a day + of shipping). The height is slightly under 12 mm which should present no problems with the cuffs of my dress shirts. A great purchase, if Matt can locate the metal bracelet that would be icing on the cake. Verified Owner Comments: The face of this Fortis watch is exceedingly well-done. It is more legible under most conditions than the well-known, rather cliche, Swiss railroad clock face. The precise indication of the second hand is superior to that design. The automatic movement is known to be highly reliable. Overall a splendid everyday mechanical watch for not a lot of money.